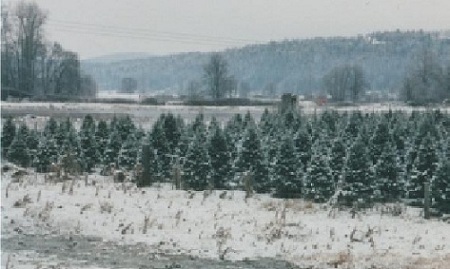 The land where the Ronnei Christmas Tree Farm is located has been in the family for over 100 years. In 1902 my Grandparents immigrated from Norway and settled on this farm in the Snoqualmie Valley. Here they raised seven children. My father went to a one room school house located on the hill behind the farm near the Novelty Cemetary. My family worked hard clearing the land, erecting buildings, and starting a dairy farm. This farm was then purchased by my Dad and Mom, who continued dairy farming until my Dad retired in 1962. I grew up with two sisters and one brother, all of us went to Carnation Grade School and graduated from Tolt High School. I worked for Weyerhaeuser until they closed the Snoqualmie plant. With time on my hands, I decided to research using my land for Christmas trees. I have planted Douglas Firs, Nobles, Grands and Frasers. So far, I have approximately 10,000 trees planted; and, depending on the species of these trees, they can take from more than five years to eight years to mature before becoming saleable. I opened for business in 2005. By word of mouth, my website, and newspaper ads, my business has grown steadily each year. I enjoy the conversations with the patrons, giving trees to little kids, providing hot cider and cookies, and producing a great product for the community.Open Day after Thanksgiving until sold out.